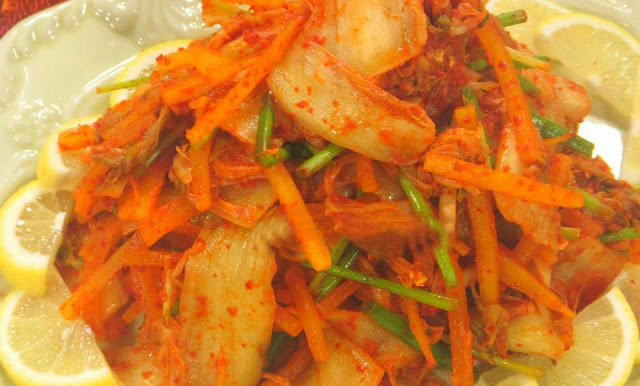 Kimchi has been an instrumental part of Korean culture and history. Throughout Korean history, the look, taste, and especially smell of kimchi have come to symbolize the triumphs and trials of this tiny peninsula. Kimchi sparkles with the flavors of garlic, ginger, and chilies. Kimchi adds zest to all foods. 1. Cut the cabbage lengthwise into quarters and remove the cores. Cut each quarter crosswise into 2-inch-wide strips. 2. Salt the cabbage. Place the cabbage and salt in a large bowl. Using your hands massage the salt into the cabbage until it starts to soften a bit, then add water to cover the cabbage. Put a plate on top and weigh it down with something heavy,. Let stand for 1-2 hours. 3. Rinse and drain the cabbage. Rinse the cabbage under cold water 3 times and drain in a colander for 15-20 minutes. Rinse and dry the bowl you used for salting, and set it aside to use in step 5. 5. Combine the vegetables and paste. Gently squeeze any remaining water from the cabbage and return it to the bowl along with the radish, scallions, and seasoning paste. 6. Mix thoroughly. Using your hands, gently work the paste into the vegetables until they are thoroughly coated. 7. Pack the kimchi into the jar. Pack the kimchi into the jar, pressing down on it until the brine rises to cover the vegetables. Leave at least 1-inch of headspace. Seal the jar with the lid. 8. Let it ferment. Let the jar stand at room temperature for 4-5 days. Serve.